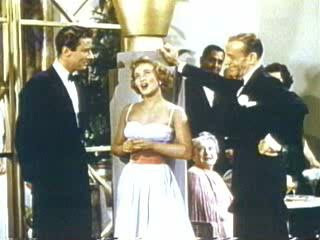 Tom and Ellen Bowen (Fred Astaire and Jane Powell) are a famous brother and sister dancing act in New York. Their agent's brother happens to be an agent in London (a very odd running joke in which Keenan Wynn plays the agent twin brothers and has them have odd phone conversations with their vastly different accents and slang). The British agent invites Tom and Ellen to perform in London for the month leading up to Princess Elizabeth's wedding. Before Ellen can leave she has to bid farewell to at least three guys she's dating. Apparently she's quite the player. As her brother says about the newest guy, "This'll probably be one of those long affairs that drags on a whole weekend." While sequentially saying goodbye to each hopeful young man before she boards her ship to England, Ellen overhears a dashing stranger doing the same thing with a string of women. "I'm in love with you?" Turns out Tom's beloved's fiance has been in Chicago for two years, and she hasn't heard from him the past two months... Hmmm...Could things be looking up for Tom? Anyways, I truly believe that Fred Astaire could dance on a ceiling if he wanted to. This movie had great dialogue, fun dance numbers, and one of my new favorite actresses. Four stars! I would watch this again.